Eric Omondi and his girlfriend have all over the local blogs posting photos and videos in their seemingly perfect relationship. But it seems all is not well with the two at the moment. The couple was caught on tape fighting in public, after Chantal saw Eric's phone messages where it seems she has been sending airtime to a few other ladies behind her back. 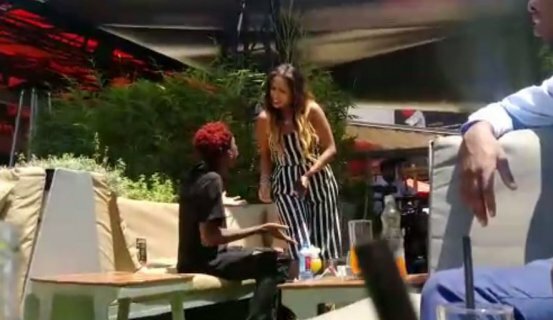 "Why are you sending her airtime, and she is not the only one," the Italian rants, "see, there are transactions of 200, 500...."
The video was captured by a member of the public seated on the next table at a popular city restaurant. In the video, Eric is seen trying to explain but Chantal could hear none of and she ends up breaking glasses and pouring water on Eric.